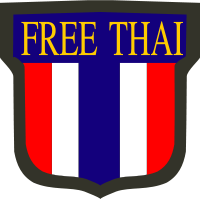 The Free Thai Movement (Thai: เสรีไทย; rtgs: Seri Thai) was a Thai underground resistance movement against Imperial Japan during World War II. Seri Thai were an important source of military intelligence for the Allies in the region. In the aftermath of the Japanese invasion of Thailand on 7–8 December 1941, the regime of Plaek Pibulsonggram (Phibun) declared war on the United Kingdom and the United States on 25 January 1942. Seni Pramoj, the Thai ambassador in Washington, refused to deliver the declaration to the United States government. Accordingly, the United States refrained from declaring war on Thailand. Seni, a conservative aristocrat whose anti-Japanese credentials were well established, organized the Free Thai Movement with American assistance, recruiting Thai students in the United States to work with the United States Office of Strategic Services (OSS). The OSS trained Thai personnel for underground activities, and units were readied to infiltrate Thailand. By the end of the war, more than 50,000 Thai had been trained and armed to resist the Japanese by Free Thai members who had been parachuted into the country. Phibun's alliance with Japan during the early years of war was initially popular. The Royal Thai Army joined Japan's Burma Campaign with the goal of recovering part of the Shan states previously given to the United Kingdom by the Treaty of Yandabo. They gained the return of the four northernmost Malay states lost in the Anglo-Siamese Treaty of 1909, and with Japanese mediation in the Franco–Thai war they also recovered territory lost in the Franco-Siamese War of 1893. M.L. Karb Kunjara (second from left) with American and Chinese military officers during his Free Thai operations in China. However, Japan had stationed 150,000 troops on Thai soil. As the war dragged on, the Japanese increasingly dealt with Thailand as a conquered territory rather than as an ally. Although the United States had not officially declared war, on 26 December 1942, US Tenth Air Force bombers based in India launched the first major bombing raid that damaged targets in Bangkok and elsewhere and caused several thousand casualties. Public opinion, and even more importantly the sympathies of the civilian political elite, moved perceptibly against Phibun's alliance with Japan. In June 1944, Phibun was forced out of office and replaced by the first predominantly civilian government since the 1932 coup. Allied bombing raids continued, and a B-29 raid on Bangkok destroyed the two key power plants on 14 April 1945, leaving the city without power and water. Throughout the bombing campaign, the Seri Thai network was effective in broadcasting weather reports to the Allied air forces and in rescuing downed Allied airmen. The new government was headed by Khuang Aphaiwong, a civilian linked politically with conservatives such as Seni. The most influential figure in the regime, however, was Pridi Bhanomyong (who was serving as Regent of Thailand), whose anti-Japanese views were increasingly attractive to the Thais. In the last year of the war, Allied agents were tacitly given free access by Bangkok. As the war came to an end, Thailand repudiated its wartime agreements with Japan. Unfortunately, the civilian leaders were unable to achieve unity. After a falling-out with Pridi, Khuang was replaced as prime minister by the regent's nominee, Seni, who had returned to Thailand from his post as leader of the Free Thai movement in Washington. The scramble for power among factions in late-1945 created political divisions in the ranks of the civilian leaders that destroyed their potential for making a common stand against the resurgent political force of the military in the postwar years. Postwar accommodations with the Allies also weakened the civilian government. As a result of the contributions made to the Allied war efforts by the Free Thai Movement, the United States, which unlike the other Allies had never officially been at war with Thailand, refrained from dealing with Thailand as an enemy country in postwar peace negotiations. Before signing a peace treaty, however, the United Kingdom demanded war reparations in the form of rice shipments to Malaya, and France refused to permit admission of Thailand to the United Nations (UN) until Indochinese territories annexed during the war were returned to them. The Soviet Union insisted on the repeal of anti-communist legislation. Sakon Nakhon historical attractions include a cave well camouflaged by lush vegetation called Tham Seree Thai (ถ้ำเสรีไทย), "Seri Thai Cave" that was used for storage of arms and food during World War II. Free Thais who received the Medal of Freedom. From left to right: Air Chief Marshall Tavee Julasup, Major General Boonmark Tesabutr, Commander Vimol Viriyavidh, Piset Pattaphongs, M.C. Yuthisatien Sawadivatana, M.L. Ekachai Kumpoo, Anond Srivardhana, Dr. Sala Tsanond, Air Marshal Sith Savetsila, Umnuay Poonpipatana, Udomsak Pasavanij, Kusa Punyarchun, Somjit Yos-sunthorn. ↑ Stearn, Duncan (2 April 2004). "Shot Down and Rescued". Pattaya Mail. Pattaya. Retrieved 2 October 2011. Many Thais resented the presence of Japanese forces in their homeland, especially since these troops tended to act more like occupiers than allies. So, whenever the opportunity arose to hinder the progress of Japanese war aims, there Thais collaboration was present. ↑ Stearn, Duncan (16 April 2004). "To Bangkok". Pattaya Mail. Pattaya. Retrieved 2 October 2011. The downed fliers were taken to Thai police headquarters where some of them received first aid and, as evening fell, they were allowed outside to wash themselves in a large pool of water. This article incorporates public domain material from the Library of Congress document: Leitch LePoer, ed. (1987). "Thailand: A country study". Federal Research Division. World War II. Thailand's Secret War: OSS, SOE and the Free Thai Underground During World War II. E. Bruce Reynolds. Cambridge Military Histories series. Cambridge University Press. ISBN 0-521-83601-8. Colonel David Smiley is pictured page 377 with his Force 136 team. The Thai Resistance Movement During The Second World War, John B. Haseman, Northern Illinois Center for Southeast Asian Studies, np, 1978. Free Thai, compiled by Wimon Wiriyawit, White Lotus Co., Ltd, Bangkok, 1997. Into Siam, Underground Kingdom, Nicol Smith and Blake Clark, Bobbs Merrill Company, New York, 1945. Colonel David Smiley, "Irregular Regular", Michael Russell – Norwich – 1994 (ISBN 978-0859552028). Translated in French by Thierry Le Breton, Au coeur de l'action clandestine des commandos au MI6, L’Esprit du Livre Editions, France, 2008 (ISBN 978-2915960273). With numerous photographs. This article is issued from Wikipedia - version of the 7/7/2016. The text is available under the Creative Commons Attribution/Share Alike but additional terms may apply for the media files.